the sign of a matured, harvestable conch. eventually I was won over. Hey… This Can Be Good! Then I complained about my inability to find them, but was frustrated by my attempts to extract and clean them, until…. is in the right spot is the first step. the conch's hold to its shell. 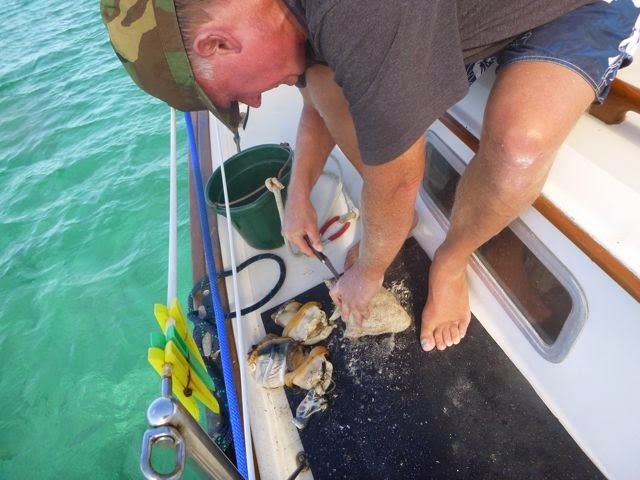 Wayne then uses pliers to pull the conch from its shell. Uhhh How Much Just to Buy It Done? Wayne felt compelled to ask. Competency does not alleviate a certain sense of horror in murdering these beautiful, slow moving defenseless creatures, even if they are delicious. Not to mention the mess, for suburbia raised squeamish sorts like us. Though I noticed with concern, when I went to buy them, they seemed to be smaller than legal size. Finally… Are These Critters the Next Carrier Pigeon? Everything ready for harvest, except the poor little lambis. "In the 1800s, the passenger pigeon (Ectopistes migratorius), named after the French word passager for “passing by,” was the most abundant bird in the world. It accounted for more than a quarter of all birds in North America, with an estimated population of 3 billion to 5 billion. The species traveled in enormous flocks, as wide as a mile and many miles long, and could strip an area of nuts within days. When the last passenger pigeon died in 1914,"-- AAAS, the non-profit science society, and its international journal, Science. 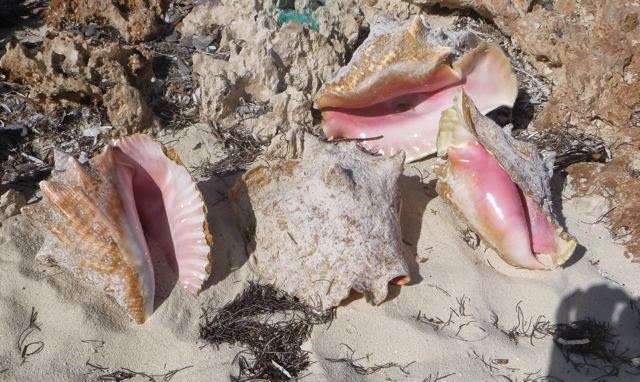 A recent article in the Bahama Pundit paints a grim picture of conch sustainability…. The minimum density required for successful mating is 50 adult conch per hectare Community Conch research confirmed that in every commercial fishing ground surveyed over the past five years there are less than 10 conchs per hectare - a density which cannot sustain reproduction. 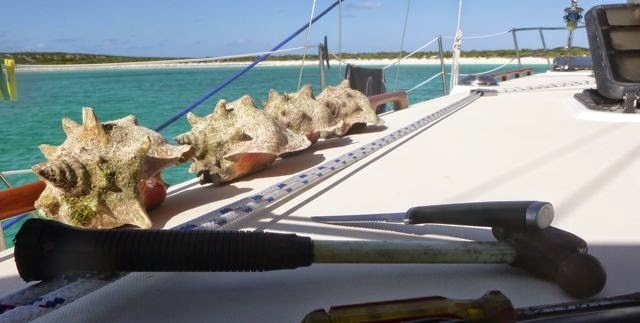 Conch has been legally exported from the Bahamas since 1992; most of it’s purchased by US importers. About 600,000 pounds leaves the country every year, which only increases fishing pressure on our dwindling conch stocks. 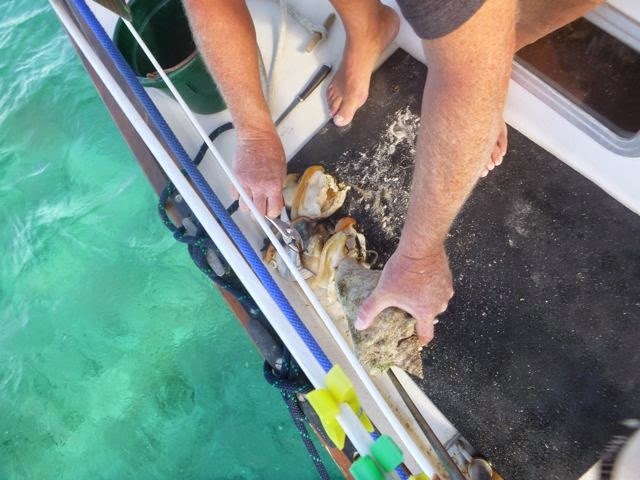 There’s talk of limiting the conch season. 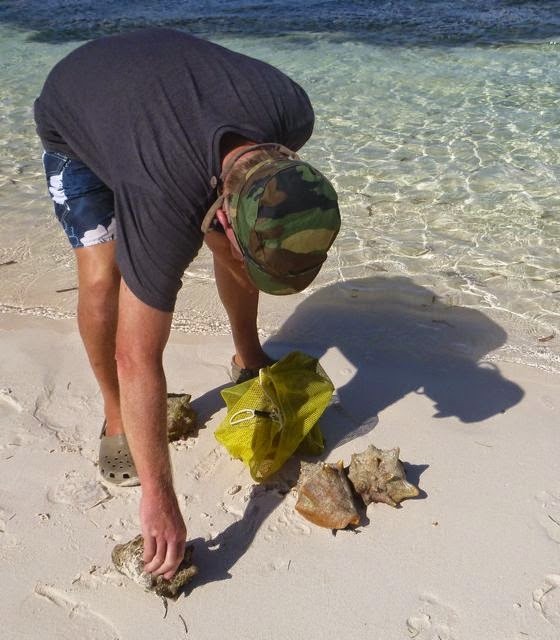 It’s becoming increasingly clear something needs to change for conch to avoid extinction. I don’t want to see those little lambis loved to death, though if we see a healthy population, we might harvest a few mature ones, if Wayne's willing to do the knocking. I do the rest of the prep and cooking, making conch salad for me, conch chowder for Wayne. This is a retrospective from our last cruising season, photos are from the Ragged Islands, Hog Cay, BAHAMAS (N22.14.920 W75.45.106). We are currently working over hurricane season in Jacksonville FL; this time with our boat “on the hard” in Green Cove Springs, until just before we leave in November, bound for the South Pacific via the Panama Canal. There’s still lots of retrospectives coming up (including one last - short - conch blog post), plus how we’ll plan for long ocean passages. Say What? Birdbrained Caption Contest.